You are being asked to voluntarily participate in a research study being conducted by NC State University for the Federal Highway Administration (FHWA). The study is addressing the operational characteristics of recreational paths and trails that are used by a variety of different users (for example, pedestrians, bicyclists, runners, in-line skaters, etc.). An important part of the study involves determining how someone like yourself perceives different trail conditions. For example, we want to know how the following factors affect your perception of the trail. 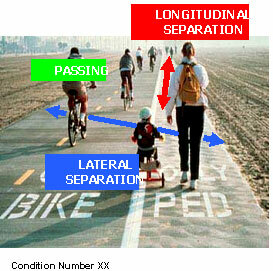 . . factors like the degree of 'lateral' separation between users (that is, the distance between you and those on your right or left); the degree of 'longitudinal' separation (that is, the distance between you and those in front of or behind you); and users' ability to pass other users when they want or need to. As a volunteer in the study, you will be asked to view thirty-six, 1-minute video segments showing a range of trail conditions and users. You will experience these conditions as if you were riding a bicycle along the trail. After viewing each 1-minute segment, you will be asked to provide your perception of trail conditions in terms of (1) lateral separation, (2) longitudinal separation; and (3) ability to pass. You will also asked to give an 'overall' rating of the trail. You will provide these ratings using the 5-point scale shown below. When you have finished with your ratings for a particular trail condition, we will move to the next condition. There will be 36 sets of conditions in all. We'll pause briefly after each 9 conditions. When you and the rest of the group have finished viewing all 36 segments, we would like for you to stay for a few minutes to collect any other thoughts or perceptions you may have that you feel were not addressed by the conditions that you viewed or the scale that you used to provide your perceptions of these conditions. Your responses will remain anonymous and will not used in any way outside the context of the present study. Your signature below indicates your concurrence with the conditions of the study. At any point in time that you wish more information about the study, you can contact either Dr. Joe Hummer (NCSU) at 919-515-7733 or Ms. An Do (FHWA) at 202-493-3319. Figure 31. Fact sheet for conformed consent.